The Bruno Cherry Sunday began in 2003 as a casual afternoon event with about 400 in attendance at the historic former St. Ursula's Academy and Convert in Bruno. Under the direction of the Carlton Trail Ag Society, the event grew over the years to a full-weekend event dubbed the Bruno Cherry Festival, featuring various local-and-beyond bands, all-day food service including a pancake breakfast and turkey supper, trade show, children's programme and more, with attendance peaking in 2009 at about 3,000 people. In 2011, organizers decided to bring the event back closer to its roots and reintroduced the festival as the original one-afternoon Bruno Cherry Sunday, featuring local talent, cherry sundaes and speakers. 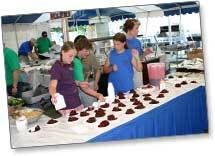 In 2012, St. Therese Institute of Faith and Mission (who since 2007 has owned the facility where the festival is held) assumed the role of organizer and added back the pancake breakfast, morning and children's events, plus the opportunity to ‘u-pick’ the delicious sour cherries in the very orchards for which the festival was founded. Event organization transitioned to a newly-formed Bruno Cherry Sunday Committee in 2016. The Committee was forced to cancel the 2018 event after their summer student grant, which had been received annually for the previous 15 years, was denied (see press release). The success of the first Cherry Sunday provided the inspiration for the community to make the festival an annual event and The Carlton Trail Agricultural Society was formed. One of the goals of the Ag. 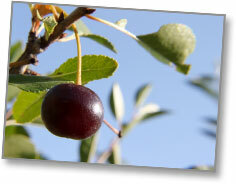 Society, in organizing the festival, was to promote and celebrate the new sour cherry varieties. The festival also provided opportunities for commercial producers and backyard growers to highlight their products. With a $15,000 grant from the Saskatchewan Association of Agricultural Societies and Exhibitors, planning for the 2004 Bruno Cherry Festival shifted into high gear. Meanwhile, in 2003, the University ended their lease agreement. This forced the Sisters to make a decision – demolish the 60,000 square foot facility or continue to operate it as an Event Centre. Under the leadership of Sister Maureen Maier, the Ursuline Sisters continued to operate the facility as the Prairie Ursuline Centre. During this time an additional 11,000 sour cherry trees were planted on a portion of the 65 acres of land on the Ursuline grounds. In 2007, the property was sold to another Catholic group who founded St. Therese Institute of Faith and Mission in the facility. This was a good fit for the Sisters as it furthered their legacy of faith formation by passing the property on to a group that held similar religious and philosophical beliefs. It kept the property viable as an important physical and economic landmark in the community of Bruno.